On the management site, head to the Menu tab. Here we will set up some new items to manage the courses. 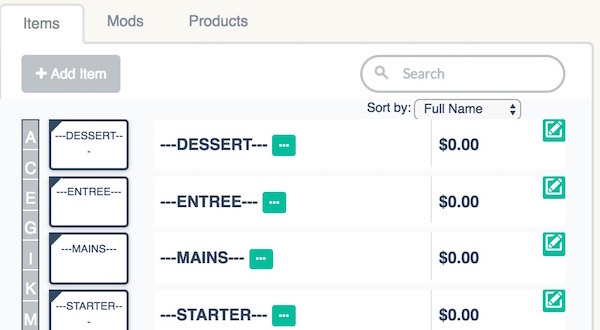 Create a new item, call it ---ENTREE--- (or similar), using dashes to differentiate it from regular items. Set the price to $0.00 and save it. Do the same for your other courses as shown below. You may also like to set up call away buttons in the same way, such as **MAINS AWAY** if you are wanting to use the printer to call away courses. Sync the menu on the posBoss iPad app and you're ready to rock! The Course splitters will print on order dockets, but as they are priced at $0, will not print on receipts. 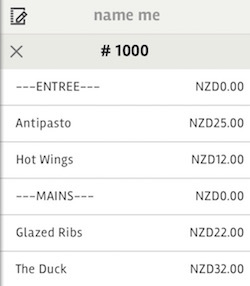 Please Note: posBoss receipts collate any identical items so if you added an item in the entree section and then the same item in the mains section, they would both appear on the receipt in the mains section as "2 X Ribs". 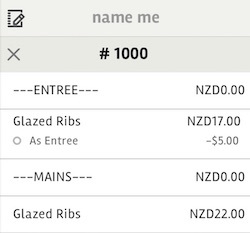 To ensure this doesn't happen, either have separate buttons - Entree Ribs & Main Ribs - or you can use mods such as "As Entree & As Main", shown below.